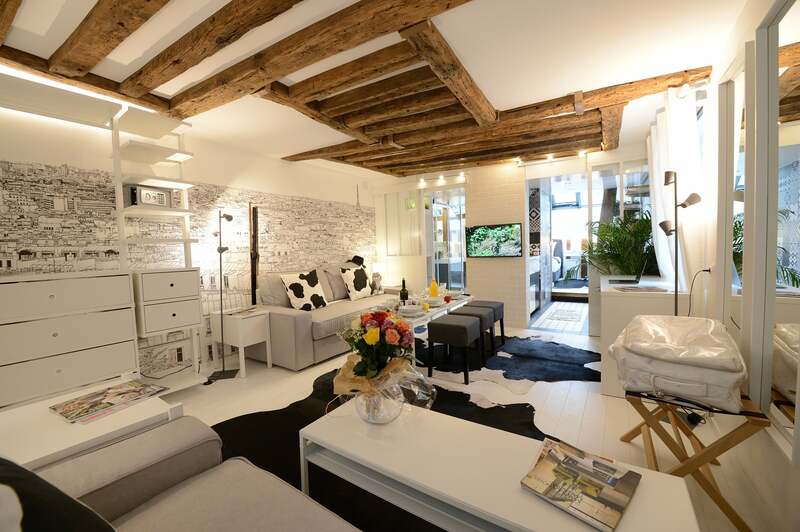 A residence in the heart of Paris nearby many museums, shops and some of the most trendy spots of the city light. A wide variety of apartments, accessible by stairs, with exposed beams and stones and in a green setting, rare in Paris, in six buildings of 18th and 19th centuries, the whole forming a private passage. The apartments and studios of our residence are designed to make you feel at home, from the moment you lay your luggage, regardless the duration of your stay. Our flats are non-smoking areas. However, you will find the patio easily accessible for your desires to smoke. Your apartment is available since 15:00 the day of your arrival. The reception manager will welcome you in the reception area, between 15:00 and 21:00. Keys are found in a safety box inside the building outside of these hours. Your apartment is to be released at 11:00. You may leave your luggage everyday from 08:30 to 20:00.